When Greg Spoon accepted a beer from a friend on Monday, May 3, 2010, he can’t have imagined what would happen. The 40-year-old Lakota Sioux man, known as “Iggy,” is soft-spoken, personable, and articulate according to friends, “when sober and in a good space.” He also suffers from serious Type 2 diabetes and has lived on the streets of Toronto for the better part of a decade. That May evening, he was hanging around Sanctuary, a well-frequented drop-in center for those in need, on Charles Street in downtown Toronto. His friend had taken the beer from what appeared to be an abandoned backpack. When the owner of the bag returned, passersby called the police. Soon Spoon was charged with theft, handcuffed, and allegedly beaten by police during what witnesses said was a diabetic seizure. He spent the night in a cell in 52 Division. It’s no secret that Toronto’s most marginalized, including people who are unemployed, under-housed, or struggling with their physical or mental health, have often been on the receiving end of police misconduct. The most recent Toronto Street Health report in 2007 showed that one in eight homeless respondents, like Spoon, had experienced police violence over the past year in the form of direct physical assault. Three quarters of those in the Street Health report did not file a formal complaint, and nearly half said they were afraid of the repercussions should they lodge a complaint—something Spoon initially also feared. The same number said they didn’t feel a complaint would achieve anything. In 2009, the Office of the Independent Police Review Director was created, in part, as a fix. 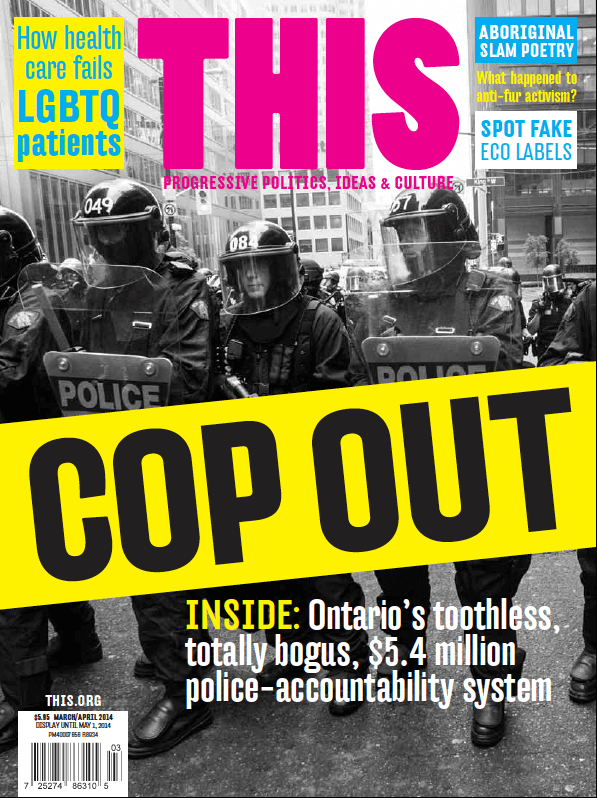 At its most basic, the OIPRD’s mandate is to provide civilian oversight of officers in Ontario, and to curb the insular cycle of police investigating police. As an independent office, the OIPRD also allows complaints to be filed online and by a third party if needed, in theory making the complaint process more accessible to people, like Spoon, who might find it intimidating to file a complaint. In fact, of the roughly 3,500 complaints received every year, about 400 are third-person complaints. Despite such lofty goals, however, five years after its launch, promises of improved accessibility and civilian oversight are still coming up short—especially when it comes to justice for street-involved folk. The Toronto Police Accountability Coalition reports that from 2010 to 2011 the OIPRD received about 4,000 complaints and dismissed 2,000 off the cuff. Of the 2,000 they did review, only 26 (0.5 percent of all complaints) were substantiated and deemed serious. By the end of that first year, just one case had lead to a non-criminal internal police disciplinary hearing, with two other hearings not yet started. In the other 23 serious, substantiated cases, there were no consequences at all. The OIPRD cost taxpayers $5.4 million for 2010-2011. The police accountability system has been under review almost perpetually since public support for scrutinizing police behavior began to rise in the ’70s. The first police complaints system was launched on a trial basis in Toronto in 1981. The system established a Public Complaints Investigation Bureau and created the role of Public Complaints Commissioner, which was later changed to Police Complaints Commissioner (PCC), to review investigations. The system became permanent three years later, eventually expanding to include the rest of Ontario in 1990. It was killed not long after in 1996, however, by then provincial premier Mike Harris. In its last year of operation, the PCC only investigated 24 of 3,549 complaints. From 1996 until the OIPRD, Ontario had no civilian oversight body to investigate public complaints about police conduct. During this time, complaints about the police were brought directly to the division. The force’s professional standards unit—the internal corrective and investigative body—would then deal with the complaint, if deemed serious enough. In 2002, the City of Toronto’s Auditor critiqued the paltry system for its lack of accountability; the system came under fire from the Ontario Human Rights Commission the following year. In 2005, the Honorable Patrick LeSage, former Chief Justice of the Ontario Superior Court, released a thorough review of what was left of Ontario’s police complaints system. To complete the report, LeSage met with community groups and police from the province and held public meetings, hearing from over 200 individuals and 85 community groups between June–November 2004. Community groups critiqued the system for being “inherently difficult to navigate” and individuals said they felt intimidated making a complaint at a police station. People also reported being discouraged from making complaints by police. The result was The Independent Police Review Act, 2007, which mandated the creation of the OIPRD. The goal: accountability by way of civilian oversight. Officially, the OIPRD is an arms-length agency of the Ontario Ministry of the Attorney General. Unlike the Special Investigations Unit (SIU) of Ontario set up in 1990, which investigates cases that include sexual assault, homicide, and serious injury, and which can charge officers with a criminal offense, the OIPRD is essentially an administrator of employment law. As such, it deals with complaints like abuse of power and lower degrees of physical assault (one drop-in user reported being weight-lifted by a police officer by his handcuffs which left welts on his wrists, just out of sight of surveillance cameras, for instance). Yet, while the G20 laid the foundation for distrust of Toronto police, recent events have served to magnify it. During the past year, Toronto Police have repeatedly attracted negative attention: the shooting to death of 18-year-old Sammy Yatim and subsequent charge of a Toronto police officer with second degree murder; the assault conviction and subsequent scant 45-day sentence of Const. Babak Andalib-Goortani for his actions against G20 protester Adam Nobody; and the practice of officers carding racialized Toronto youth—not to mention the Rob Ford investigation. Most recently, the shooting of Michael MacIsaac by Durham Regional Police on December 2, 2013 reaffirmed the public’s call for de-escalation training for officers and increased deployment of mental health crisis intervention teams when dealing with psychiatric survivors. On a Thursday night in November 2012 at Sanctuary, the drop-in is bustling with people here for the home cooked shepherd’s pie, nicknamed “God’s pie” by the cook. I’m here with Doug Johnson Hatlem, a 36-year-old staff worker. His hair is disheveled, and a faded, blue jean shirt hangs off his lean shoulders. He is slouched next to me in a black faux-leather chair. Hatlem looks relaxed, but his eyes are darting around, keeping tabs on who is coming and going out of this basement hang-out. The other day I witnessed Hatlem pry himself free of a drunken headlock. The drop-in center is loud with the clanking of dishes and conversation. Hatlem introduces me to Jason Greig, who is also here for supper. It’s an unusually warm Toronto day for November; Greig’s wearing a tank-top that shows off his biceps. Since the food’s not yet being served, we walk outside together so Greig can smoke. We sit side by side on a concrete planter across from Sanctuary. It’s the same planter where Spoon was sitting before he was beaten. Grieg is part Anishnabek and says he has struggled with addiction ever since he was 11, when he witnessed his three year-old brother get run over by a car. In and out of prison for years, Greig has been out for about four months, his longest stretch of freedom in six years. Greig, 40, tells me the story of that night when Spoon was beaten and Greig himself was charged with assault, for which he served 60 days in Toronto’s notorious Don jail. As Greig was walking down Charles Street by Sanctuary, a man he guesses was a little older than him called him over to the pay phone where he was standing and offered him a drink; “I said sure.” But Greig says the man soon propositioned him, asking how much it would cost to have him for the night. Greig told him: “More than you’ve got in your wallet,” at which point he says the man grabbed his crotch. Greig responded by hitting the man several times, after which he says the man ran away, leaving a backpack full of beer behind him. Soon after, Iggy and two friends who had been hanging out on a nearby bench checked out the bag and shared the beer. Spoon is a well-known character around the drop-in, equal parts articulate artist and brazen alcoholic. “You’ve got to catch him on a good day,” I was advised. (Spoon agreed to be interviewed for this article, but did not show up to four appointed interview times over the course of two months.) Known for hollering in the street, Spoon’s speech is often slurred and he can appear drunk because of his diabetes, which requires regular insulin shots. It’s sometimes hard to know whether his behavior is a result of blood sugar level or blood alcohol level. That night Iggy was having a diabetic seizure, says his friend “Seven,” who I met with while he was panhandling outside a nearby mall. Police were called after the man Greig punched claimed he had been robbed. When four officers arrived at 10 p.m., Spoon was handcuffed for suspected robbery and did not resist arrest. Around the same time as the arrest, Greg Cook, a young staff worker at Sanctuary, was at his desk in a makeshift office at the top of the church that houses the drop-in. He began to hear yelling on the street below, and headed down. What he saw next compelled Cook, a missionary kid who grew up in South East Asia and self-described non-confrontational person, to shout. Across the street, one of the police officers had grabbed Spoon, pushed him face down on the concrete and kicked him in the back more than five times, says Cook. “They had him in handcuffs and he was in the fetal position,” adds Seven, who witnessed the event. About four or five police on bicycles and three cruisers were on the scene, accounting for about 10 officers. Cook shouted at the police to stop, at which point, he says, the officer “stopped kicking … and instead stood on Greg Spoon’s back with one foot.” Seven also said the police had stomped on Spoon’s head at least twice. As a roughed-up Spoon was driven away in a cruiser, Cook resolved to file a complaint with the OIPRD about police misconduct on his behalf. At first, Spoon feared police retaliation, but after a week or so, he gave Cook the okay. Officer David Hopkinson of 51 Division in Toronto can’t resist a hardware analogy. During a coffee break at the Ontario Police Complaints System forum at Metro Hall in November 2012, I ask him to tell me his view on the OIPRD. “If you have a broken table, you can glue it, screw it, nail it or use duct tape, but if you use all four methods you know it’ll be solid,” he explains, “there’s more than one way to fix a problem.” (I try to imagine what my husband would say if I tried to fix a table with duct tape.) Hopkinson can see the doubt in my face and admits that the metaphor doesn’t totally work. The point, he says, is that there are four different ways a person can make a complaint about the police: through the Human Rights Commission, the OIPRD, the courts, or the SIU—and complainants need to keep trying until they find the right avenue. Afterwards, Hopkinson strides over to Hatlem with a preacher’s fervor, cutting him off at the croissant and bagel table, now littered with empty cream cheese packets after the morning’s frenzy. “Can I offer you a different answer?” Hopkinson asks, launching into the duct tape table solution. Hatlem engages the officer for a minute but I can see he is edging his way past the cream cheese packets and plastic knives towards the coat rack. Later, a young man who works with youth in Regent Park describes the everyday reality of the police-youth relationship. “Even my two-year-old doesn’t like police,” he says, adding he believes his community has never had any community efforts from police. After he speaks, officer Hopkinson leans back in his chair and turns to the guy, pointing at him and motioning with the same evangelical fervor, “I’d like to talk to you afterwards,” he says in a low voice. After the discussion, the two men connect and Hopkinson later tells me he’ll be speaking at an upcoming Regent Park youth event. By all means, this is a man with good intentions. She responds to the critique of police investigating police with the same worn tone: “Even though the investigation is sent to the police service to investigate, when they send the investigative report back to our office we have dedicated staff who look at every,” pause, “single,” pause, “report.” Capogreco looks visibly lighter when she steps down from behind the podium. The message—is the system perfect? No, but we’re doing the best with what we have. Six months after Cook filed his complaint, he and Spoon had their answer: the claim was unsubstantiated. The OIPRD said other witnesses, including an Intelligarde security guard, four police officers, and four civilian witnesses, claimed the officers did not use excessive force. Cook requested a review, but again the matter was found to be unsubstantiated. Hatlem is still livid—particularly considering what he saw as false testimony from the security guards. Sanctuary staff and clients have both had run-ins with the guards before. Hatlem has begun a push for greater police accountability to address the violence that the city’s marginalized often experience. With a sister who was on the street for years, he is known to be an outspoken advocate. He recently organized direct action training to help people living on the street deal with police after the Parkdale neighbourhood death of Chris Gardian in 2011, an alleged result of police violence. (Hatlem did all this on paternity leave). And, until his recent move to Chicago in June 2013, he also led monthly street memorials in downtown Toronto for homeless people; he continues to work on a co-operative documentary about police violence in Toronto. While we sit, Hatlem tells me he filed his first third-person complaint with the OIPRD in 2011 after months of waiting for police to file charges against two security guards who assaulted Sanctuary drop-in users in February 2010. That night, one of Sanctuary’s interns, Aylish Chantler, was sitting with three drop-in users huddled in the doorway of a nearby parking garage, drinking to keep warm. Without warning, security guards appeared and aggressively ordered them to leave. Before they had a chance to move, one of the guards targeted one of the drop-in users, Chris Van Hert, repeatedly kicking and stomping on him. Police were called and Chantler reported what she had seen. Two of the homeless individuals were arrested and brought to 52 division; the security guards continued with their evening’s work. “It’s like a completely different standard of justice,” says Hatlem. The drop-in staff alerted the media shortly after, and the CBC was on the scene that evening. As a result, the police took statements from the two homeless men, and released them instead of keeping them overnight. But then, recalls Hatlem, “they kept not filing the charges [against the security guards], not filing the charges, not filing the charges.” When Hatlem filed the complaint, the OIPRD investigator set up an informal meeting with representatives from Intelligarde, Sanctuary, and Van Hert, something Hatlem sees as a step in the right direction. However, during the meeting Van Hert was immediately blamed by the security guards for the event. Van Hert’s response gave the company pause: “It doesn’t matter what I did,” he said, “I didn’t deserve to be beat up like that.” When the OIPRD investigator still said he would not press charges, however, Van Hert left the meeting angry. Hatlem’s complaint was later deemed by the OIPRD “serious” but unsubstantiated. Wednesday WTF: "Trust us to police ourselves," says RCMP. No way.